TOKYO -- Takata Corp. said it wants to avoid bankruptcy globally because a court-led restructuring could disrupt the supply of parts to automakers, the first public comments the embattled airbag supplier has made on an option being considered in the United States. Takata shares have fallen 14 per cent since Bloomberg reported Sept. 16 that some form of bankruptcy proceedings were being considered by bidders for the company, which is at the centre of a record auto industry recall. Autoliv Inc., Key Safety Systems Inc., Flex-N-Gate Corp. and Daicel Corp. -- bidding together with Bain Capital LP -- proposed bankruptcy for Takata’s U.S. unit at meetings with automakers last week in New York as a way to limit liabilities, people familiar with the process said. The Japanese manufacturer has hired Lazard Ltd. as its financial adviser and the law firm Weil Gotshal & Manges LLP to help weigh options including bankruptcy or a sale. The Japanese manufacturer may choose to seek court protection just for its U.S. unit, the people said. KKR & Co. has dropped out of bidding for Takata, the people said. Takata’s market value has plunged 72 per cent in the past year to US$271 million (Cdn $364 million). Its airbags use a propellant that can be rendered unstable after long-term exposure to heat and humidity, leading their inflators to rupture and spray deadly metal shards at vehicle occupants. At least 17 deaths have been linked to the defect in the United States., Malaysia and India. The Nikkei reported today that a bankruptcy filing by Takata’s U.S. unit could help the company find a buyer and continue supplying parts while seeking an out-of-court reorganization. Nomura said the company isn’t the source of the information and declined to comment. Takata today raised its full-year profit forecast after selling an interiors business and stakes in Japanese automakers. Net income will be 20 billion yen (Cdn $261 million) in the year ending March, compared with a 13.1 billion yen (Cdn $170 million) loss in the previous 12-month period. The company was previously projecting a 13 billion yen (Cdn $169 million) profit for this fiscal year. Net income was 16.2 billion yen (Cdn $211 million) in the July-September quarter, compared with a loss of 8.7 billion yen (Cdn $113.5 million) in year-earlier period, the company said. 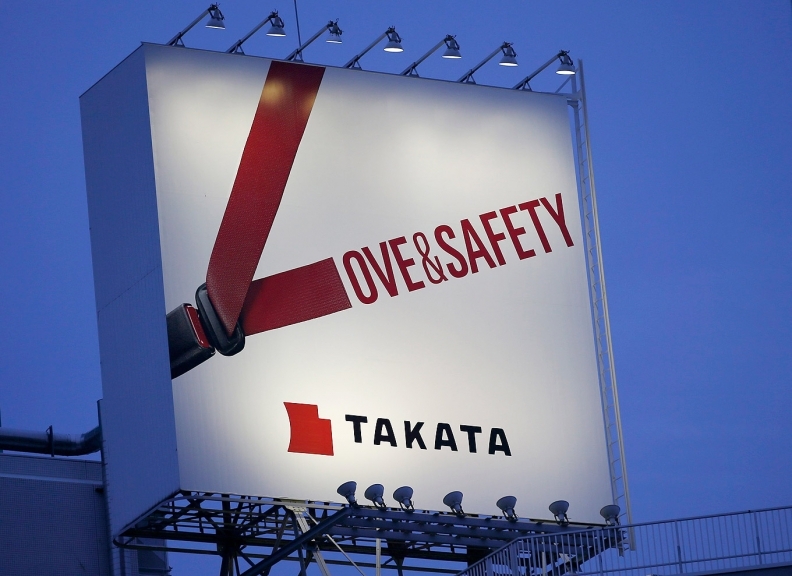 Takata has sold all stakes it owned in Japanese automakers, Nomura said. The company held shares of Honda Motor Co., Toyota Motor Corp., Nissan Motor Co., Fuji Heavy Industries Ltd., Mitsubishi Motors Corp. and Suzuki Motor Corp. as of March 2015, according to its annual report. At the meetings with automakers last week, Autoliv, Key Safety Systems and Flex-N-Gate dropped their proposals for Takata to also file for bankruptcy in Japan, after carmakers expressed concern about the potential disruption for sub-suppliers in a previous round of talks, the people said. Only the Daicel-Bain pairing is still recommending Takata file for bankruptcy in Japan, the people said. Daicel shares plunged 18 per cent, a record, today after the company cut its fiscal year operating profit forecast on Wednesday. Regulators have ordered recalls scheduled through at least 2019 that could eventually exceed 100 million airbags used by more than a dozen automakers, including Honda, Volkswagen AG and General Motors. The automakers have a vested interest in who ends up taking over Takata because they’ve already shouldered billions of dollars in repair costs.